1960 Chevy Biscayne Photo Picture Classic Cars for sale & Classifieds - Buy Sell Classic Car & Classic Truck Classifieds. CHECK OUT THIS 1960 2 DOOR CHEVROLET BISCAYNE THAT WAS SAVED FROM BEING MELTED DOWN AND TURNED INTO IPSCO PIPE. I'm going to pull that hay baler out of there some day and restore it. I'M PULLING THIS ONE HOME THIS SUMMER. i ALSO GOT THE BLACK ONE AND THE 4 DOOR SEDAN FOR PARTS. THESE SHOULD KEEP ME BUSY. I'm a novice to the old car enthusiast ranks and this is a darn shame. I would kill for one of these cars. I have my eyes on a 62 Bubbletop!! We all need to save as many of these vehicles as possible...with the high price and demand for scrap metal...EVERYTHING is going to the crushers/recycling yards... And then they are gone "Forever".. 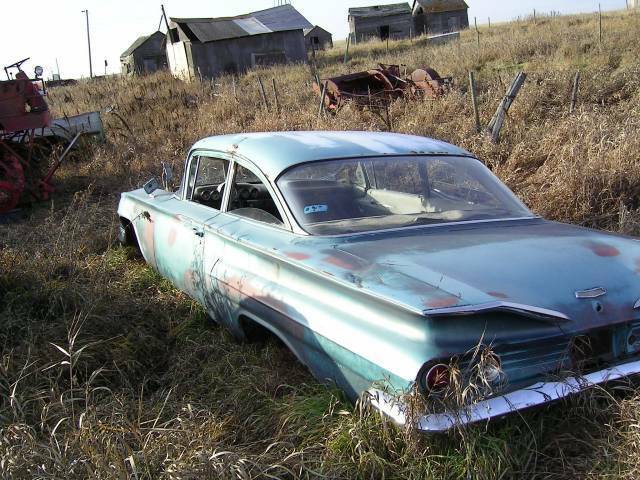 This 1960 Biscayne is located in Saskatchewan Canada. About 12 miles away in another field is another 60 Biscayne 2 door black in color. 10 miles south of this one is a 4 door sitting for about 8 years but is complete and drivable. except You cant get rid of an ex-wife as easily as a car You dont want anymore..hehehehehe. Fairly straight looking body, wish I could find them that straight around here. These days it seems most of the old cars on my side of the state have been hauled off because people thought they were "Eye-Soars". Unfortunately there are a lot of people on this planet who just dont get the old car thing..no passion for real chrome and steel....I know its hard to believe...!! !...my exwife was always calling my 48 panelvan....a piece of JUNK...aaarrrghhhhh. Excellent...another classic saved from the crusher...!! !